Chris Bradshaw believes the relentless run of fixtures may be starting to catch up with his Desborough Town players. Third-placed Ar Tarn are preparing for a top-of-the-table clash in the ChromaSport & Trophies United Counties League Premier Division tomorrow (Saturday) as they take on second-placed Eynesbury Rovers at the Waterworks Field, having snatched a 2-2 draw at Sileby Rangers on Tuesday night thanks to a late goal from the boss’ son Aidan. 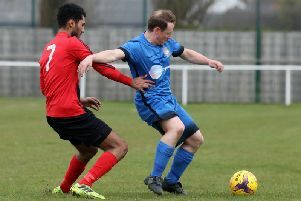 That came on the back of a 1-0 defeat at Deeping Rangers last weekend, in which Bradshaw felt his team were unfortunate to see their 13-match unbeaten run in the league ended. But the busy schedule continues next week with Desborough set to face Sileby again, this time in the last eight of the NFA Hillier Senior Cup. And the Ar Tarn boss has admitted his hand may be forced when it comes to changing things around. “It was strange last Saturday because I came away from a defeat feeling pretty happy,” he said. “We played well and we didn’t deserve to lose. A draw would have been fair. “I told the players I wanted a response to the result, not necessarily the performance, on Tuesday and, to be honest, we were pretty awful all over the pitch and came away with a 2-2 draw. “It makes me wonder whether playing Saturday-Tuesday-Saturday is starting to catch up with us a bit. “We have Sileby again in the Hillier Cup next Tuesday and I may have to look at that and perhaps change our priorities a little bit. “It might sound a bit big time but the number of games is relentless at the moment so we may look at changing it. “But we have to focus on Saturday because Eynesbury are flying. They are on the back of beating Peterborough Sports and they beat Cogenhoe in midweek. Shaun Sparrow has warned his Rothwell Corinthians not to become complacent in the run-up to Christmas. Corinthians have enjoyed a solid start to the UCL Premier Division campaign and sit in ninth place after they fought back from a goal down to draw 1-1 at Leicester Nirvana on Tuesday night. Their next task is a home match against Boston Town this weekend. And joint-boss Sparrow insists his team must continue to pick up results to ensure they remain in the top half. “It’s a busy time of year and the number of matches are relentless,” he said. “But the one thing we can’t do is get complacent. Someone was telling me that on New Year’s Day last season we had 20 points so we are well ahead of where we were then. “But you have to keep yourselves going and there is a big run of matches coming between now and Christmas. “We will look at bolstering the squad a little bit but the key for us to try to keep improving. “We wanted to improve on last year and, so far, we have done that. But we want to stay in and around the top half of the table so we need to keep picking up results. Jon Mitchell says Wellingborough Town must pick themselves up for tomorrow’s home clash with Yaxley after they suffered a third defeat in a row on Tuesday. Three first-half goals proved their undoing as they lost 3-1 to Newport Pagnell Town at the Dog & Duck. And boss Mitchell insists he will be working hard to try to get the Doughboys out of their “downward spiral”. “To be fair we created our own problems in the first half, it wasn’t good football on their behalf that got them 3-0 up, it was down to mis-placed passes from us and us not winning enough first balls,” Mitchell said. “But for 20 minutes in the second half the lads put a shift in and if we had performed like that over the whole game, maybe it would have been different. “We are on a bit of a downward spiral at the moment. “But all we can keep doing is picking ourselves up and move on to the next game.